Usually navigation menus are common across all pages of a website. But, should you have navigation menu on a landing page as well? Or, should your landing page be unique in itself and there is no need to include global navigation menu? 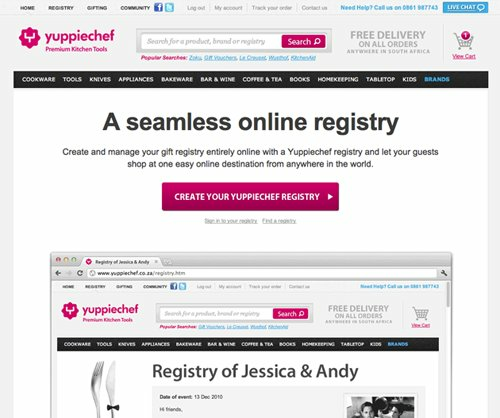 This is a perfect case for A/B testing and one of our customers, Yuppiechef, did this test and found out that removing navigation menu doubled their conversions. Yuppiechef is a leading online store selling premium kitchen tools throughout South Africa. They are known for their customer service, quirkiness and passion for getting people excited about eating together and spending time in the kitchen. They used Visual Website Optimizer to A/B test the effect of removing the navigation menu from one of their landing pages. They were certainly surprised by the results! The new variation of the page without the navigation bar at the top of the page delivered twice as many conversions as the original page! The conversion rate jumped from 3 to 6% with an effective 100% increase in conversions. Who wouldn’t be happy about such results? Hope this case study gives you an inspiration to test navigation menu on your own landing pages. We don’t guarantee that you will also increase your conversions by 100% but this test is certainly an easy one to setup. And, who knows, maybe you do significantly increase your conversion rate. The only way to find out is to actually setup an A/B test. I think this is going to be a big thing in 2011. I am going to sign up for your product now. If it’s any good I’ll try and send some business your way. This is a great test to do, however my experience is that you had to be careful with the removal of navigation. – 94% of people didn’t register – you need to make sure that these people have somewhere to go. Without navigation this makes it more likely that they will bounce. I’ve seen examples of 90%+ bounce rates on landing pages because there was simply nothing else to do. Pages like that seem to be saying “Register or GO”. When it comes to a landing page, we have to take chances. We call a landing page, a landing page because we have specific goals for it. If we allow people to deviate from what we want them to do, then I think we will be lowering conversion rate. Sure, a lot of people might leave. But then, they might have reached the landing page via other pages on the same site or via ads. If they don’t convert, its probably because they dint find what we have to offer useful and so bounces are acceptable. It should be a win-win situation. You point is debatable. But we never know which situation is better unless a lot of such tests are done. Typically I have seen pure landing pages with just one call to action and no navigation. Take a look at 99% of the info product landing pages and you wont find navigation. A/B testing in theory is fantastic. However, knowing what to change in priority is an artform.